This week Access All Areas members have a fantastic set of quick and easy to use textures to download, courtesy of Brent Galloway. 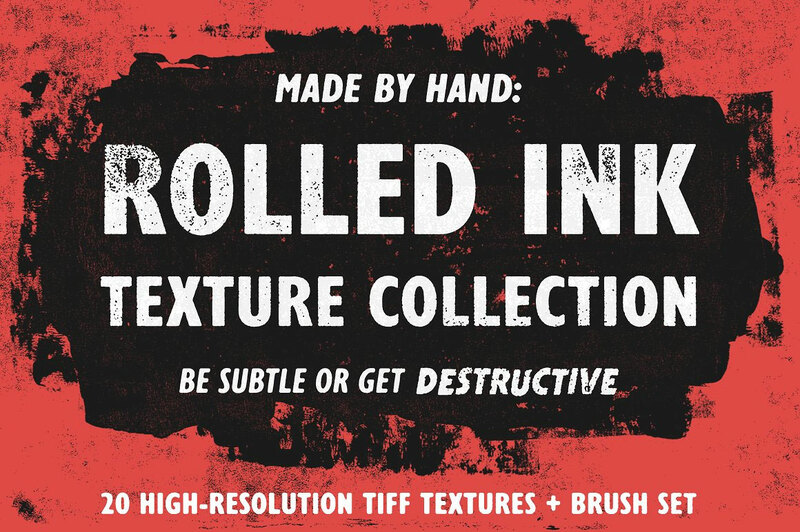 This collection of rolled ink textures contains 20 high resolution graphics made by hand with a rubber roller and ink. Use them to add that worn look to your t-shirt designs, lettering pieces, photos, or any type of design you’re working on. They come in a multitude of formats, including 1200dpi TIFF images, 300ppi PNG files with transparency, and 5000px Photoshop Brushes. Brent Galloway is a full-time freelance graphic designer who specialises in designing t-shirts. A huge portion of his work is designing merch for the music industry. He shares high quality digital resources for the creative community on his Creative Market shop. These are the same resources he uses himself in his day-to-day design work. The Rolled Ink Texture Collection contains 20 high resolution texture images in a variety of useful formats. Easily change the colour of the TIFF textures in Illustrator with one click, layer up the PNG textures with transparency in Photoshop for endless combinations, and save the Brushes directly in Photoshop for quick access. I love the subtlety of this kind of overlay/texture. They are great to work with! Thanks to Brent and you, Chris! Glad you like Brent’s work! This is really a very useful set of textures And the brushes also :) thank you!